Pakistan’s claims that it does not have terrorist training camps in its territory has been strongly contested by the FBI which has told a US court that satellite pictures pointed towards such a camp. 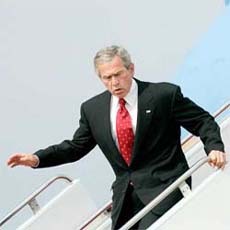 President George Bush reacts as he stumbles while walking off Air Force One after returning to Andrews Air Force Base, Washington, on Monday. Bombs killed at least 43 persons on Tuesday, including 23 Iraqi soldiers, in the latest blow to the new government’s efforts to inspire confidence in the country’s security forces. After a revolutionary transformation into a secular state from the world's only Hindu kingdom, Nepal is now poised for another radical change that allows for a queen on the throne - provided the monarchy survives. In the trial of 23-year-old Pakistani American Hamid Hayat, who has been accused of terrorism-related charges, Defence Intelligence Agency’s expert Eric Benn has stated that there was as much of a 70 per cent “probability” that the satellite images pointed to a militant training camp near Balakot in northeast Pakistan. Much to Pakistan’s embarassment, Benn told the district court in California that although he did not “detect any formal weapons training”, including firing ranges, targets, rocket launchers or explosives testing, it did not mean they were not taking place. The structures and trail in the remote terrain fit the “signature” of “militant training”, as opposed to regular training of Pakistani armed forces, he said. Hamid’s sentencing has been postponed by the court by four months to November and his father Umer Hayat, who at one time was charged with lying to the federal authorities, is being retried after the first round ended in a hung jury, according to media reports. The allegation against Hamid has been that from California’s area of Lodi, which has a small Pakistani immigrant community, the 23-year-old went to Pakistan to attend a religious school and training for terrorism with the intent of returning to the US to commit violent acts. The reports said Hamid, who was to be sentenced on July 14, is facing charges of militancy and “jihad” which can give him a jail term of as many as 39 years. The federal prosecutors want to nail their suspect — and indirectly Pakistan — in the terror training camp case. Hamid’s jury was shown satellite images taken between 2001 and 2004 of a Pakistani national forest which was on a mountainous terrain and about 10 km from Balakot. A roadside bomb attack on a bus filled with soldiers on a road between Tikrit and Baiji, north of Baghdad, killed at least 23, the army said. A source at the joint Iraqi-U.S. military coordination centre in Tikrit said the toll could rise. “The bodies are being removed from the bus,” he said. In Baghdad, a suicide bomber in a car targeted soldiers collecting their salaries from a bank, killing at least 10 persons, including an elderly woman. The attack took place at the same spot in the district of Karrada where a car bomb and mortars killed at least 27 persons last week. A car bomb exploded as a police patrol passed in front of a hospital, killing at least seven person and wounding eight, the police said. In Kirkuk, a roadside bomb killed two police men and wounded a third as they conducted a patrol. Israel thrust into southern Lebanon today and pounded towns and villages in two other areas, meeting fierce resistance from Hizbollah guerrillas who reportedly killed three soldiers. Three weeks after the war erupted when the Hizbollah took into custody two Israeli soldiers in a cross-border raid, a senior Israeli Cabinet member said the army needed up to two more weeks to finish its offensive. European Union President Finland, echoing the growing international calls for a ceasefire, said Israel’s plans to sweep further into Lebanon were unacceptable and would only fuel more Arab support for Hizbollah fighters. Israel wants to push the Hizbollah back and stop it by blasting rockets over the border. Artillery shells rained down on the border area around Aita al-Shaab, where the Hizbollah said it had destroyed a tank in battles with Israeli troops. Al Arabiya television said three Israeli soldiers died in the clashes, which would be the first casualties since Israel lost nine soldiers on July 26. The Hizbollah said it had inflicted 20 Israeli casualties in Aita al-Shaab. The Israeli army said 20 Hizbollah fighters were killed in south Lebanon during the past 48 hours. The Hizbollah denied suffering any serious casualties. The intense fighting came the same day as Israel’s Security Cabinet approved an expansion of its military operations in southern Lebanon. This would entail a military ground sweep 6 to 7 km into Lebanon, a political source said. India and Pakistan have agreed to continue their composite dialogue peace process, which came to a halt last month following the serial blasts in Mumbai on July 11, for which India has blamed Pakistani radical groups. Coming out of a bilateral meeting held on the sidelines of the SAARC Standing Committee meeting here, the Indian and Pakistani foreign secretaries expressed the view that the peace process should continue. "The peace process between the two countries is important and all possible efforts should be made to see that this process is not in anyway adversely affected," Indian Foreign Secretary Shyam Saran told reporters after meeting his Pakistani counterpart Riaz Muhammad Khan. The sideline meeting lasted for nearly an hour and was held late on Tuesday night. Mr Khan said the peace process is important for both countries. "There is no other option," he added. Asked what was discussed, he said: "We discussed where we stand and how should we move forward." He termed the meeting as a positive one and assured his Indian counterpart to extend every support for the investigations into the Mumbai blasts, for which the peace process had been stalled. Mr Saran said they discussed every aspect of the bilateral relations. Asked whether a future date for the resumption of peace talks had come up during the course of the meeting, Saran said that the talks would continue as per an agreed timeline. Nepal's cabinet on Monday took the historic decision that in future, the king's firstborn would be his heir, irrespective of gender. If implemented, the decision will see the sceptre passing into the hands of Crown Prince Paras after King Gyanendra and then to Princess Purnika, the former's first-born. While Paras' inheritance would not come into dispute since he is the first-born of King Gyanendra and Queen Komal, who also have a daughter, Princess Prerana, there would be a sea change after that. Paras and his wife, Crown Princess Himani, have three children: Purnika, 6, Hridayendra, 5, and Krittika, 3. Till now, going by the tradition, it was assumed that Hridayendra would succeed his father. He is known as the navayuvaraj, or the heir to the Crown Prince. In Nepal's feudal royal society, the little prince is brought up as a future king of Nepal. However, with the new decision by the seven-party government, the palace would have to make readjustments. In addition, parliament has usurped the function of choosing the royal heir. If that too is implemented, the crown prince, known to be headstrong and autocratic, may not succeed King Gyanendra. Finally, the very fate of monarchy hangs in fine balance. The government as well as the Maoist insurgents have agreed on holding an election that would ask people to choose if Nepal should remain a kingdom or become a republic. Prime Minister Girija Prasad Koirala has told the United Nations the poll would be held by April next year. If the election is free and fair, with the growing resentment against the king for ruling the country with an iron hand for 15 months after seizing power through a coup, Nepal might opt for another revolutionary change and become a republic. Meanwhile, the cabinet meeting Monday agreed to scrap state allowances to most members of the royal family. Now only the king, queen, crown prince, his wife and the Queen Mother, Ratna Rajya Laxmi Devi Shah, would be entitled to a state allowance. Other royals like the king's grandchildren and daughter will no longer enjoy the state largesse.